What are the best colored pencils for coloring books? Markers? Pens? There’s really no one answer to any of those questions. It soon becomes clear that there is a large selection of coloring supplies to choose from. Pens, colored pencils, markers, crayons, and all mediums in between have their own benefits. Each can provide a completely different look and feel to the same page. Start combining different coloring tools, and the opportunities for creativity and innovation become endless. This guide will help give you a feel for the different mediums most commonly used by colorists. It will help you understand the pros and cons of each medium, so you’ll know how to achieve the result you’re looking for. Colored Pencils are the adult colorist’s standby – Old Faithful. They’re cheap, you can buy them in bulk, they last a good while, and the color selection tends to be much larger it is for ink-based media. Pencils are more forgiving of mistakes (it’s much easier to remove pencil pigment from the page than ink!) However, they do have some downsides. If you rush with your colored pencils, you’re going to end up with uneven colors and noticeable pencil strokes. You’ll need to vary your strokes to properly hide them and lay down even colors. Colored pencils need time to build up clean, vivid colors, and you’ll probably still never get the color saturation of a pen or a marker, even on high-grade paper stock. If you’re coloring on a rough sheet with a lot of tooth, and you take the proper time to build up your values, you can still get incredibly bold, rich colors out of pencils. Colored pencils really shine when it comes to gradients. Blending and shading are more advanced techniques that you can use to really enhance your work. Since colored pencils build up pigment on the page slowly over many strokes, it becomes much easier to gradually blend one color into another. This can lead to some really impressive visual effects in your art! Generally, colored pencils are great entry-level tools that are versatile enough to remain useful throughout your coloring career. These are what most colorists begin, and many don’t feel a need to use much else. Nothing wrong with that! Colored pencils are generally safer and easier to store compared to other art supplies. Since they don’t contain ink, you don’t run the risk of them leaking and staining your belongings. Still, pencils are fragile and should be treated with care if you want to maximize their life span. Investing in a good pencil holder is a good way to keep your collection safe and organized. Some cases come in canister form, where as others look more like binders and can hold a larger number of pencils. You want something provides a bit of padding to prevent a sudden shove or fall from damaging your pencils. Colored pencils are cheaper than other art supplies, but not necessarily more durable. Once you break the pigment in the core of the pencil, you will likely run into issues. If you find that the lead keeps falling out of your pencil when you sharpen it, the core is most likely damaged. It can be very difficult to repair a pencil that is broken internally. Depending on the material used in the pencil’s core, you may be able to melt the center to repair the damage. Many people claim that soft pencils like Prismacolors will melt in direct sunlight. Other, harder colored pencils may require a bit more heat to melt and repair the pigment core. Whatever you do, do not use the microwave to heat up your colored pencils. This is a serious fire hazard and can give off hazardous fumes. If you’ve broken a pencil more severely, you should consider replacing it. If the wood surrounding the pigment has broken or snapped, it is not worth it to try and repair the break. You can sharpen the broken pieces and use them as smaller pencils. Also, many online art suppliers will sell individual pencils. With persistence, you can replace almost any pencil that breaks. 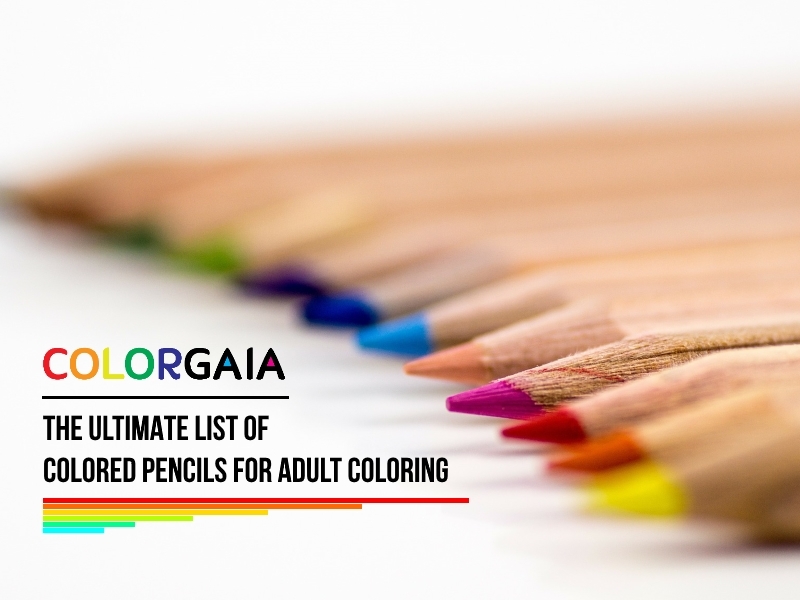 If you’re looking for a colored pencil recommendation, check out our Ultimate List of Colored Pencils for Adult Coloring, where we sort over 60 colored pencils from best to worst in real-time based on your votes. There tend to be some crossover between pens and markers, but we generally consider pens to be the finer spectrum of ink-based media and favor a firmer tip, whereas markers make up the thicker spectrum and have spongy tips that have some give. Pens are great because they have a similar feel to pencils, so it’s easier for pencil-users to start incorporating them into their work. The ink also catches and saturates the paper much more easily than pencil pigment, so you can get the vivid colors you’re looking for without repeatedly going over your work. Since pens have finer points, they have the same tendency as pencils to leave noticeable stroke marks if not used correctly. It can help to go into pen coloring with a plan to maintain a consistent direction with your pen strokes to avoid textures showing through your colors. Even though pens use ink, the fine point also means it can still take a fair amount of time to complete a coloring project. The ink also means you have to be careful of your pen bleeding through onto other pages, but this is more of an issue with markers. Pens have pretty much the same color variety as colored pencils, but the good selections are harder to find. They’re also more expensive, especially as you get into the premium brands. Pens can be really fun for making your own additions to your coloring pages, or for coloring your own patterns rather than filling a space with a solid color. They have a very clean look and can get the fine-detail / color-saturation combo that colored pencils can’t. Markers are a lot of fun. If you want the richest colors you can get in the shortest time frame, markers are your best bet. Thicker than pens or pencils, markers can cover a lot of ground fast. Since they’re ink-based, you’re generally never going to have to double back over your strokes; markers are a one-and-done tool. Markers are like explosives: if you’re not careful, you can do a lot of damage very quickly without realizing it. Most colorists main complaint with them is that they bleed through to other pages, especially on lower-quality paper. If you’re working in a double-sided coloring book, a few clumsy marker strokes can easily ruin the next several coloring pages. Markers also put out A LOT of ink, and especially if you’re coloring on computer paper, you can soon find the page crinkling and curling as every it struggles to soak it all up. Like pens, markers are perfect for making your own additions to your coloring pages. Larger empty spaces and backgrounds can be quickly filled with some marker doodles, creating more sections to fill in with your medium of choice. UPDATE: Many readers have written in to mention that there are specialized markers such as Chameleon Pens that are specially made for blending and do it very well. You might think that you can toss your new art markers in a drawer like any old permanent or dry-erase marker. That’s not the case. In order to get the most longevity out of your markers, it is important to store them properly. If you do, you’ll be able to color with them for years to come. The best markers are expensive; taking the time to maintain them properly will be worth the extra effort. Most manufacturers recommend that you store markers upright, with the tip pointed up. There are many reasons why this is a better storage position than laying the markers flat. Ink plays a large role. Brush tip markers and other porous materials can start to leak if the tip gets over-saturated. On it’s side, the liquid in a marker has the opportunity to reach the nub. When they are stored upright, gravity keeps the ink from reaching the tip. Ink leaks are no fun. Uncapping a marker to a big spurt of dye can ruin a moment pretty quickly. However, leaks aren’t the only issue. When ink builds up in the porous tip of a marker, it can prevent it from releasing as much ink. Colors can begin to look faded after a long time. This is just another reason to keep your markers vertically rather than horizontally. A lot of markers are double-ended, which begs another question. How do I keep the tip upwards if both ends have tips? The best solution is to alternate which end is upright as often as you can. Most double-ended markers have been designed with leaking and over-saturation in mind. Certain markers, like Copics, allow you to refill the ink cartridge so that you can use the marker over and over again. The refilling process is different for each brand. Some markers have a central ink container that you can access by unscrewing the shaft. Sometimes this container must be refilled with a syringe-like tool, and other times it can be replaced entirely. Copic markers can be refilled via an ink container and precision applicator tool. The nib of the marker must first be removed. Afterwards, the ink can be injected into the marker in the newly-revealed hole. Once the marker is refilled, the nib can be replaced and the coloring can begin again. 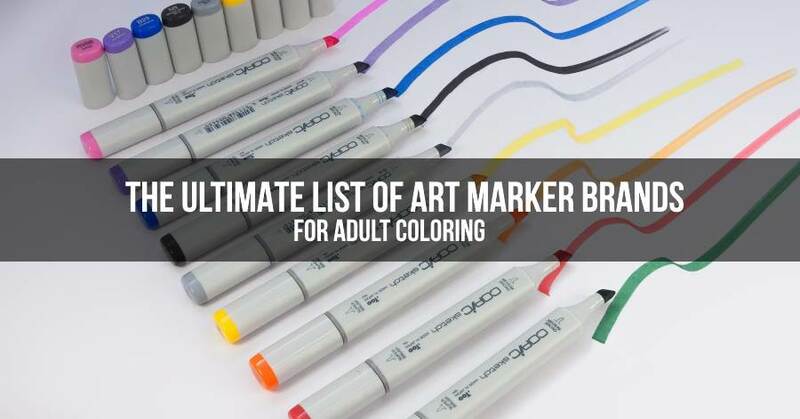 If you’re looking for an art marker recommendation, check out our list of the best markers for coloring, where we rank over 20 different markers from best to worst in real-time based on your votes. Crayons tend to be more polarized than other media when it comes to quality. There are lots of cheap, low-quality crayons, and there are lots of expensive, premium-brand crayons, but not so many in between. Cheap crayons like Crayolas tend to always show the underlying texture and can leave a waxy sheen over your art if you apply them too liberally. Premium pastel crayons are softer and can apply a heavier coat in a single swipe, which helps prevent those textures from showing through. You’ll pay through the nose for them though, and crayons (especially the pastels) get eaten up very quickly. Many pastels also need to be sprayed with a fixative to ensure they don’t rub off, especially when shut inside a coloring book. Many colorists find alternate uses for the cheap Crayola crayons, such as melting down the wax for use on it’s own. Dripping, mixing, layering, and countless other options present themselves once the wax is liquid, just be careful not to hurt yourself when applying it! If you’re looking for more in-depth information on a particular product, check out some of our supplies reviews. We review pencils, markers, pens, and all things in between. Be sure to check back for the latest updates!